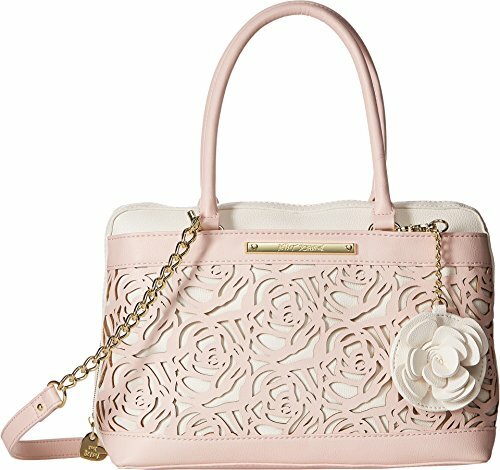 Your style will be coming up roses with this lovely Betsey Johnson® Roses Satchel. Made of synthetic leather. Zipper closure. Two rolled carrying handles. Removable crossbody strap with chain detail. Exterior features a beautiful floral design at the front, two slip pockets, and a removable 3-D flower charm. Flat base. Lined interior features one zip and two slip pockets. Imported. Measurements: Bottom Width: 12 1⁄2 in Depth: 5 1⁄2 in Height: 7 1⁄2 in Strap Length: 50 1⁄2 in Strap Drop: 22 1⁄2 in Handle Length: 17 1⁄2 in Handle Drop: 6 in Weight: 1 lb 4 oz This product may have a manufacturer's warranty. Please visit the manufacturer's website or contact us at [email protected] for full manufacturer warranty details. This sweet little handbag will add the perfect charming touch to your look! Made of synthetic leather. Zipper closure. Two rolled carrying handles. Removable shoulder strap. Exterior features a quilted design. Flat base. Lined interior features one zip and four slip pockets. Imported. Measurements: Bottom Width: 7 3⁄4 in Depth: 3 3⁄4 in Height: 7 1⁄4 in Strap Length: 50 1⁄2 in Strap Drop: 21 1⁄4 in Handle Length: 12 in Handle Drop: 3 in Weight: 11.8 oz This product may have a manufacturer's warranty. Please visit the manufacturer's website or contact us at [email protected] for full manufacturer warranty details. 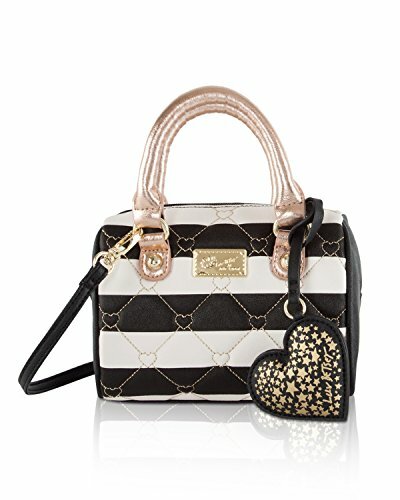 Carry everything you need in style, This Luv Betsey Harlii Mini Barrel Satchel Crossbody Bag Features; PVC heart embroidered striped body, black sides with printed heart hanging signature keychain, luv betsey logo plate, top zip closure, duel rolled handles 3 drop, , fully lined Interior, enough space to fit your cell phone, wallet , keys and couple small items. This bag will become your ôgo-toö bag for running errands. Detachable cross-body strap offers security while wearing, double styling and fun! 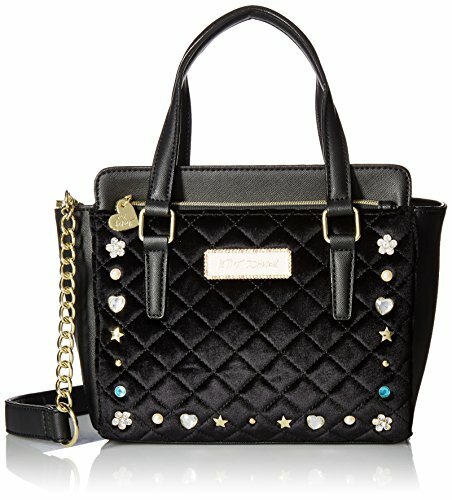 Adore your look this season with the Top Handle Logo Satchel by Betsey Johnson®. Made of man-made materials. Top-zip closure. 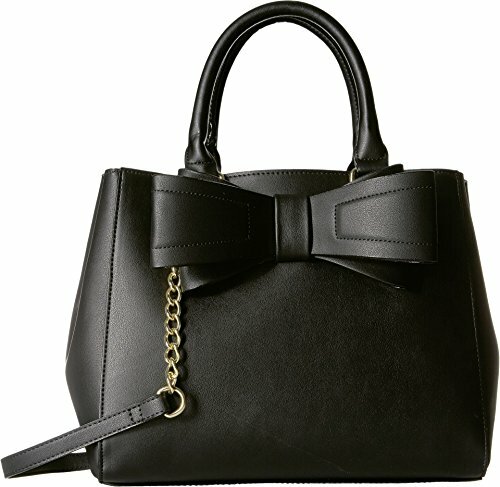 Dual-rolled handles, with bow-detail below and cross-body strap. Exterior flaunts floral design. Lined interior dual zip-and-slip pockets. Flat-bottom. Imported. Measurements: Bottom Width: 12 in Depth: 3 3⁄4 in Height: 9 in Strap Length: 52 in Strap Drop: 25 in Handle Length: 11 in Handle Drop: 4 1⁄2 in Weight: 1 lb 10 oz This product may have a manufacturer's warranty. Please visit the manufacturer's website or contact us at [email protected] for full manufacturer warranty details. 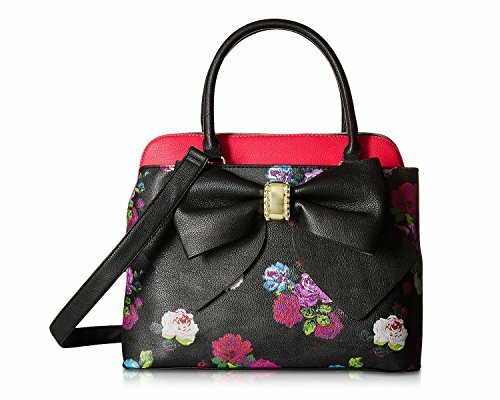 Tie off your look with the Betsey Johnson® Bow Satchel handbag. Made of synthetic leather. Zipper closure. Two rolled carrying handles. Large bow detail with floral designs. Removable crossbody strap. Exterior features two button-snap pockets at front and back. Flat base. Lined interior features one zip and two slip pockets. Imported. Measurements: Bottom Width: 13 1⁄2 in Depth: 7 in Height: 12 1⁄2 in Strap Length: 50 in Strap Drop: 24 1⁄2 in Handle Length: 18 in Handle Drop: 7 in Weight: 2 lbs 0.6 oz This product may have a manufacturer's warranty. Please visit the manufacturer's website or contact us at [email protected] for full manufacturer warranty details. 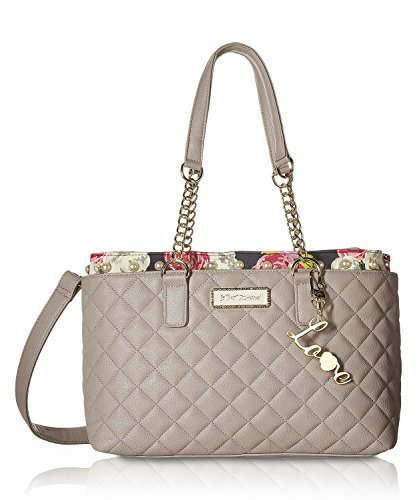 This Quilted Diamond Faux Leather Grey Multi Triple Entry with Zipper Center Divider with 2 exterior snap entries as well is a must have. Floral Print Contrast with Faux Pearl Detail Trim with Gold Tone Metal Hardware & gold tone metal Betsey Johnson Love Charm/Key chain with rhinestone detail Betsey Johnson front exterior monogram plate! Dual Chain faux leather handles with an adjustable detachable shoulder strap & zipper closure. Betsey Johnson Signature Monogram lining with back wall zipper pocket plus 2 slip pockets. 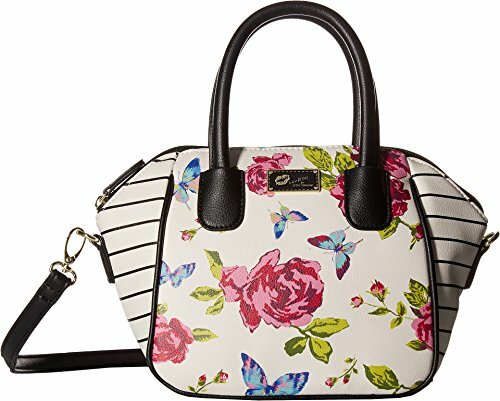 Dimensions: W x 15 x D 5 x H x 9" Dual Chain Strap Drop: 9.5"
Let your style soar to new heights this season with the Betsey Johnson® Winged Medium Satchel. Made of polyester. Zipper closure. Two flat carrying handles. Removable and adjustable crossbody strap with chain detail. Exterior features a quilted design, stud detailing at the front, one top-entry zip pocket at the front, and a slip pocket at the back. Flat base. Lined interior features one zip and one slip pocket. Imported. Measurements: Bottom Width: 9 in Depth: 3 in Height: 8 in Strap Length: 17 in Strap Drop: 7 in Accessory Strap Length: 49 in Accessory Strap Drop: 23 in Weight: 1 lb 6.4 oz This product may have a manufacturer's warranty. Please visit the manufacturer's website or contact us at [email protected] for full manufacturer warranty details. 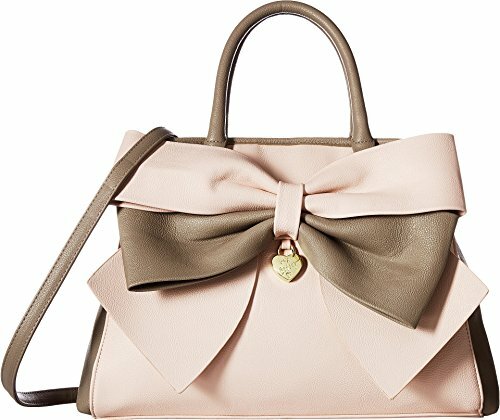 Dress fancy and classy with the Big Bow Satchel. Made from 100% PU. Toggle closure. Dual rolled carry handles with additional cross-body strap. Front, over-sized bow accessory. Flat bottom base. Interior zip pockets with two additional slip pockets. Imported. Measurements: Bottom Width: 13 in Depth: 5 in Height: 11 in Strap Length: 42 in Strap Drop: 21 in Handle Length: 14 in Handle Drop: 7 in Weight: 1 lb 9 oz This product may have a manufacturer's warranty. Please visit the manufacturer's website or contact us at [email protected] for full manufacturer warranty details. 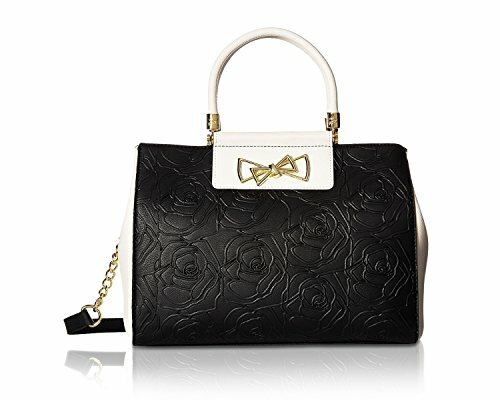 What's in my Betsey Johnson Black & White Satchel Tote Bag.